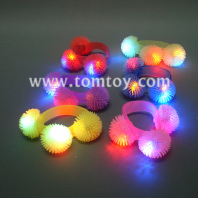 TOMTOY LED shining bracelets. Innovative, cute looking and amazing flashing, which are popular, eye-catching and cool. OEM/ODM your own design, or printing your own logo, are also available. Easy to assemble and disassemble (TM02321)，With great battery capacity; Size fit for men, women and children.